This wonderful owl was made by Michael Hunter for Twists Glass in 2017. His back, sides and the top of his head are made of zanfirico canes being white alternating with black & white. He has large latticino eyes with a murrine cane centre, a yellow cane beak and his breast is made of white zanfirico canes alternating with rows of black & white triangular murrine canes, there being a double row of murrines in the centre of his breast. He is hollow blown and is scratch signed "M Hunter Twists 17" and has a Twists Glass studio label. Although all Mike's owls are special, this is a very special little fellow indeed! 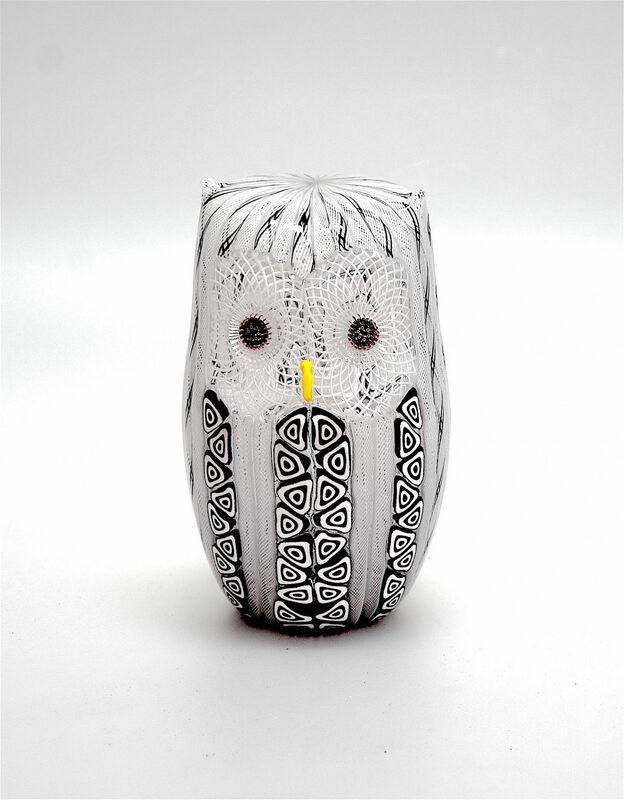 I asked Mike to make a white owl with large latticino eyes and murrine canes - Mike rightly felt that he needed a little colour and I capitulated on the inclusion of black. So here he is waiting for a new nest!